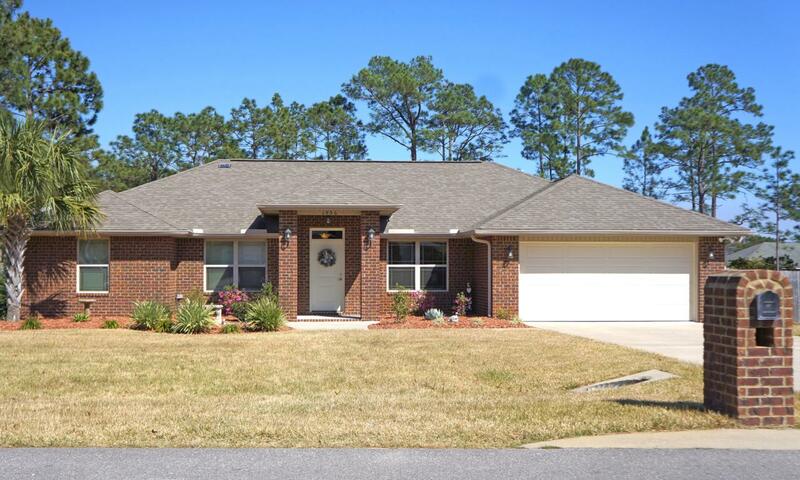 Welcome home to 1956 Indigo Dr, Navarre FL. This one-owner home is move in ready! Custom built in 2013 energy efficient home has a split floor plan including 4 bedrooms and two full baths. With 1936 square feet of living area, Indigo drive resides on nearly half an acre surrounded by architectural privacy fencing. Low cost to own due to maximum insulation in both the walls, attic and garage.HVAC includes Infinity Carrier Unit with 5 stage air handler and humidifier. The unit comes with a transferable warranty good til 2023. E glass windows with Argon insulation attribute to this homes incredible energy efficiency.This is one of the few homes in Holley By The Sea development not on a septic system. The custom kitchen has maple cabinets and granite counter tops.Upgraded appliances and an extra large pantry make this a great place for the gourmet cook in the family. His and hers deep sink vanities in the roomy master bathroom also have granite counters and there is a separate walk-in shower. The whirlpool tub is a great way to relax at the end of the day. Bull nose corners on all walls. Media wiring is prevalent throughout the home including pre-wiring for a home generator. Tile floors throughout the kitchen, hallway, dining & living and bath rooms accent the open living areas, while carpeted bedrooms and closets invite the warm and private living spaces. The added utility sink in the laundry room provides another benefit to homeowners. A transferable Security Alarm system and termite bond are also included. The 538 square foot east facing enclosed screen patio offers great afternoon views of the manicured backyard, with a ready to use Marino Jacuzzi Hot Tub for any season. The nearly half acre lot is irrigated by a timered jet pump drawing a rust free, no smell watering from its 90 ft deep well. Zoned irrigation across the front lawn's zoyia grass and flower beds display the pride of ownership in this exceptionally well-maintained home. The spacious 10 X 16 work shed with loft storage sits atop a concrete slab and provides a boat/RV parking pad. Buyer to verify all data and dimensions. Make your appointment to see this great property today.